The economics of the dental profession have never been more challenging. The average dental student graduated with $261,149 in student loans in 2016, and 30% of dental students graduated with more than $300,000 in debt. I have two student loan consultations coming up with dentists married to one another with joint loan balances over $1 million. 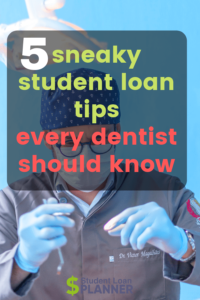 Here are five ways dentists can protect themselves against student loans. If you’d rather hire someone to look out for your interests, email me at help@studentloanplanner.com. I’ve used these five tips to save my dentist clients over $80,000 each. There are three major student loan repayment programs you should know about. More likely than not, your financial aid “counselor” will not explain these options to you. Income based repayment (IBR) is the oldest. Pay As Your Earn (PAYE) came after IBR to offer borrowers better terms. In December 2015, Revised Pay As You Earn entered the picture to add another option still for borrowers. There are two versions of the IBR plan, the old and the new. For everyone who borrowed before July 1, 2014, old IBR applies. For those who started borrowing after, the new version applies. The main difference between the two versions is the percent of discretionary income that goes to loans. The old version requires 15% of income and the new version only requires 10%. The other difference is the loan forgiveness term. Old IBR requires payments for 25 years, and new IBR requires payments for 20 years. Very few dentists will find these forgiveness terms relevant as the balances will be gone by then for most. PAYE is only open to borrowers who took out their first loan after October 2007 and received at least one loan after October 2011. This means a large percentage of dentists will not have PAYE as an option. The loan servicers usually recommend PAYE to anyone who calls if it is available. The federal government sets the low monthly payment at 10% of discretionary income. Additionally, loan forgiveness occurs after 20 years of payments. Most dentists will pay back their loans before they come close to forgiveness. Also, keep in mind that private sector loan forgiveness is taxable income. The reasons the loan servicers push PAYE to everyone else do not really apply to dentists as much. The final major income based repayment program is the Revised Pay As You Earn (REPAYE) program. This new program came about in December 2015. It requires 10% of discretionary income go to payments. However, unlike IBR and PAYE, there is no ability to exclude spousal income from the monthly payment calculation by filing taxes separately. Even so, it also covers half of all the interest not paid for with the monthly income based payment. In most cases, REPAYE is the best friend of dental residents and postgraduate students because of this incredible interest subsidy. If a dentist can make the full Standard 10-year monthly payment, then he or she probably needs to consider refinancing. More on that later. If a dentist has a current low income whatever the reason, choosing the right income based repayment program is really important to prevent the balance from growing to an unmanageable level. Most folks will want to use REPAYE unless they have a spouse with high income and no student loans. In that case, you should run an analysis to see if PAYE or IBR makes sense. these options at one point or another. I cannot stress enough how much I recommend against using forbearance or deferment. Many dental residents get themselves in big trouble by doing a 2-4 year program and not paying a dime on their loans. While they put off payment, the loan balances continue to grow. The sad part is they could actually control this debt growth simply by entering into a program like REPAYE. Such a plan would reduce their effective annual interest rate in half in many situations. Instead, many dental residents allow the debt to compound at a 6%-8% rate. This results in a balance approximately 25%-50% higher than when they started training. After all, dentists usually have to pay tuition and fees during residency and postgraduate training too. dollars in government interest reduction benefits and a manageable balance to pay down when they enter practice. Interestingly enough, buying ads on Facebook for dentists costs a lot of money. So does purchasing ads on Google that include the words “dental” and “loans.” Clearly, new dentists are targeted by purveyors of five and six figure consumer purchases. Dentists have to put off gratification for a long time. Once that first real paycheck hits, there is no shortage of people who want to lend money to you based on that recession proof, high, and stable income. However, if you indulge yourself and buy a house and new car right away, there will be less money available to pay down debt. Paying back multiple kinds of large loans at once is what keeps so many dentists working well into their 60s and 70s. Dental student debt is horrible for your own personal financial health. The interest rates usually average around 7%, which on an after tax basis is over 10%. Mortgage brokers will approve you for a house over three times your income even though you have six figures in student loans. Car dealerships will eagerly sign you up for a five year lease on a brand new Audi. If you live near the water, buying a new boat will also beckon. You must resist buying anything in the high five or low six figures preferably until all your student loans are gone. If you must buy before then, then at least make sure a substantial portion of the student debt is gone first before adding more. The old adage “renting is throwing money away” is just not accurate. Medical professionals of all stripes are targeted by unethical financial advisors, but particularly dentists. If you go into practice immediately after dental school, a dentist can have the fastest high income of all medical professionals. Medical residents might earn $60,000 out of medical school, while a new associate dentist could easily earn double that. Variable annuity and whole life insurance salesmen know this fact all too well. They will always be on the lookout for new faces in town with high stable incomes. Unless an advisor is a fiduciary, I would refuse to do business with him or her. Any advisor who does not have the fiduciary, or legal, responsibility to put your own interests ahead of their own cannot be trusted to handle your finances. To show what I mean, consider my shock in a recent client phone call. Her advisor had recommended not one, but TWO whole life policies for her to purchase. This was despite having annual interest rates above 8.6% on her loans. He had recommended to my client instead that she put her loans on forbearance and deferment for as long as possible. The whole life policy at best was supposed to return about 4%. He exaggerated even this low return so he could foist these useless whole life policies onto her. My client trusted this man, but I knew what he did. Whole life insurance agents often earn 100% of the first year’s premium in commission, and usually 50% of the second year’s premium. When this large payday ran out, he contacted my client again to sell her another policy to generate another commission. This man was clearly a self interested scumbag. Perhaps I am being too harsh, unless we recall that he actively encouraged her to pay nothing on her super high interest debt to accommodate the purchase of an unnecessary financial product that most people allow to default before using. I’ve experienced unethical financial advisors in my personal life as well. When my girlfriend was in fellowship during surgical training, she was frequently invited to “free steak dinners” to discuss her asset accumulation strategy. Such events are usually fronts for annuity and whole life salespeople to seem legitimate. If my girlfriend had not been dating someone in finance at the time, she might have attended one of these events and been sucked into their false marketing pitch. Aside from saving enough in your 401k to get the employer match and building an emergency fund with three months’ expenses, put all your excess funds into paying off your student debt. I have no clue why so many dentists give tens of thousands of dollars in free money to the government every year in unnecessary student loan interest payments. The federal government sets the rates for the least qualified borrowers. That’s why the rate is usually north of 6% on most direct student loans. When dentists obtain their first paycheck, their interest rate is no longer reflective of their credit risk. 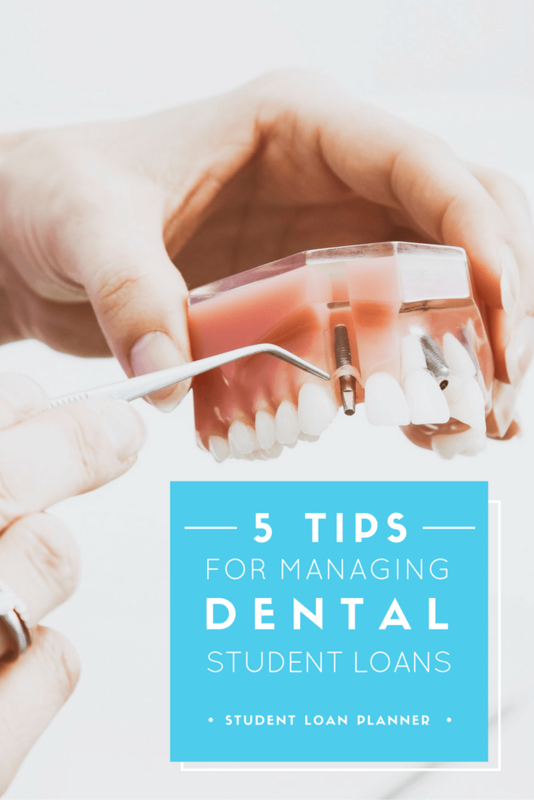 Most dentists would save a ton of money by refinancing their student loans as soon as they earn their first real paycheck. If you have student loans, I’d highly encourage you to contact me for a private consultation as I have special relationships with refinancing partners. Check out our partners where you can refinance your student loans. The final tip I would have for dentists is to protect their educational investment with disability insurance. At least keep this policy until you’ve saved enough money to be financially independent. The government usually forgives student loans in the event of disability. However, you might not qualify if you were simply unable to practice dentistry but still able to work. Every new dentist should have a disability policy. Unfortunately, there is no good way to obtain a cheap disability policy without going through an agent. The commission is built into the cost of the policy. You can’t really go around the agents and save money. Hence, you might as well use them for their knowledge and expertise. When buying disability insurance, I highly suggest using an agent who exclusively sells disability policies. That way you will avoid expensive financial advisors from Tip #4. Disability insurance is something that woefully few dentists have. Once you have a policy, you’ll be able to protect the most important investment in your portfolio, which is your dental education. Now Go and Get Rid of Some of that Student Debt! Dental school leaves most people riddled with student debt. If you choose the right repayment program for your personal situation, avoid forbearance or deferment, don’t buy big ticket items until your loans are gone, dodge expensive financial advisors who give bad advice, and refinance student loans once you have a real paycheck, you’ll potentially save hundreds of thousands of dollars and be way ahead of your peers. This is the best way dentists can protect themselves against student loans. My business model here at Student Loan Planner, LLC is providing dentists student loan advice. I only charge a one time fee to help with student loans. I perform a comprehensive loan analysis to see what your best available repayment options are. If you’ve already used forbearance during residency, what’s the best way to get back on track? You should look at the various income based repayment programs available to you and start one immediately if you’re in residency still. If you’re past that point and are in training, then you’d want to compare private refinancing with REPAYE to see which choice results in lower total loan costs. Can you explain a bit more why going to REPAYE, rather than deferment, is beneficial? If you’re in a residency that pays you nothing, for example, wouldn’t your payment be zero anyway, and hence, your student loan balance continues to grow? Even if you are in deferment, couldn’t you also just continue to make token payments whenever you want to cut down some of the accruing interest? Since most dentists won’t ever qualify for PSLF, does it really matter what you pick at the beginning? I would think what really matters is refinancing once you have the big paycheck and paying it down fast? Thanks! Keep in mind that true cost of attendance is 20% to 30% higher because the schools don’t include loan origination costs, accrued interest, or tuition inflation.